Languedoc-Roussillon region, also known as Languedoc, covers a large part of southern France including main cities such as Montpellier and Nimes, as well as coastal resorts with long sandy beaches. The region offers a range of accommodation. Languedoc-Roussillon, also known as the Languedoc, is the central region of the south of France; it includes the western Mediterranean coast of France, the Rhone valley in the east, all the way down to the Spanish border. The region offers miles of sandy beaches, marinas and small ports. The regional capital, Montpellier with its old centre, the Musée Fabre, churches, is a popular city holiday. Within this region is the Le Canal du Midi, the world's oldest commercial canal. The Canal links the Mediterranean and the Atlantic offering shaded cycleway and footpaths. The Canal system is also an UNESCO world heritage site. Another world heritage site within this region is Le Pont du Gard, an impressive Roman aqueduct, just north east of Nimes. Thanks to its unique north-south stretch through the south to the centre of France, Languedoc-Roussillon contains a variety of landscapes and weather types. In the south, the region borders the Mediterranean Sea, Angola and Spain, and therefor shows signs of low scrub, vast yellow hills and almost desert landscapes. Towards the north, it is a very different story. The lush green forests of northern Languedoc-Roussillon are a world away from the almost arid southern regions, and the rolling hills and soft valleys house many of France's most beautiful castles and palaces. 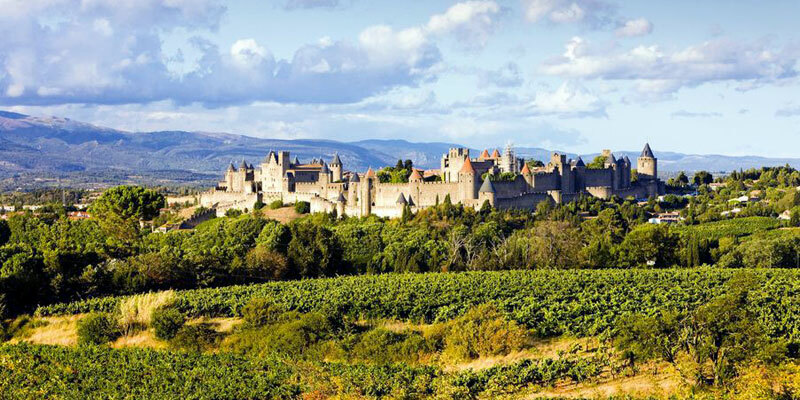 Languedoc Wine Tours is the best way to discover the wine, gastronomy and history of one of France’s most diverse and beautiful regions.